HomeFeatures StoriesI-Day Special: Top 10 Sub-20 Lakh Vehicles With 4x4 For The Wanderer In You! I-Day Special: Top 10 Sub-20 Lakh Vehicles With 4x4 For The Wanderer In You! It is good to see that more and more people are taking road trips to offbeat locations these days, which has perhaps boosted sales of these 4x4/AWD-equipped models! How many times has the craving for camping out at an isolated, far-flung place, which is virtually unreachable, hit you? Do you plan your long weekends to such locations sitting in your 9AM-5PM work cubicle to satiate your wanderer soul? Are you one of those who prefer going to offbeat locations rather than doing touristy things? Going to such locations certainly gives us a sense of freedom and gratification that we miss living in concrete jungles, isn't it? Today, we bring you the best ten 4x4/AWD-equipped high riders in the sub-20 lakh bracket to accompany you effortlessly on your wild escapades! Do keep in mind these SUVs if you’re planning for an upgrade. This is the most economical 4x4 on sale in the country and the most basic one as well! 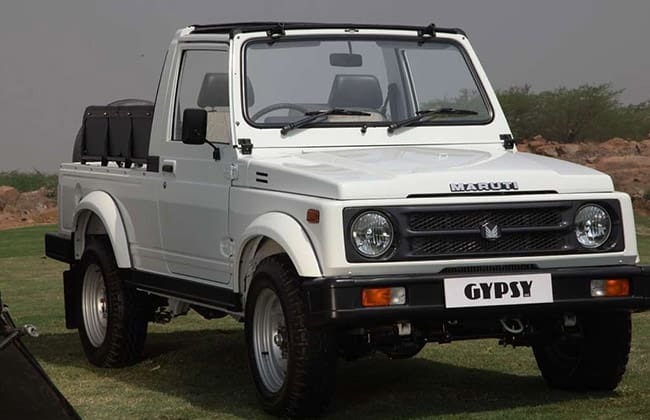 The Maruti Gyspy pampers you with absolutely nothing, no air conditioning, power steering or electric windows! Also, there are no airbags or ABS (anti-lock braking system) for you. What you get is 210mm of ground clearance to tackle almost any terrain. And a lightweight 985kg four-wheel-drive SUV, which is often touted as the ‘Mountain Goat’! This bare basic Maruti with its naturally aspirated 1.3-litre 81PS petrol engine and below 1-tonne weight (soft-top) can give a lot of other SUVs a run for their money both on tarmac and off road. It also happens to be the only petrol 4x4 SUV in the list! The Mahindra Thar flaunts the classic Jeep looks inspired from old Mahindra models, which were licensed from Jeep USA. It resembles older generations of the Jeep Wrangler so much that with a little modification you can get the latter’s appearance. Like the Gypsy, the Thar is also a bare-basic offering built for purpose. That said, you do get basic necessities like power steering and manual air conditioning with windshield demister. And with the latest update, Mahindra has given a much-required overhaul to the interior of the Thar. What you get is a redesigned dashboard, which looks relatively premium, along with wider seats. A much-needed mechanical locking rear differential has also been added to the equipment list. Force Motor has thoroughly updated its Gurkha SUV this year and it received an updated BS4 engine as well. While the Thar looks like a Jeep Wrangler, the Force Gurkha resembles the Mercedes-Benz G-Class SUV (Force used to make licensed products from Daimler). In fact, if you just remove Force Motors’ logo and place Mercedes’ star logo, a lot of people would mistake it for a G-Class! The updated 2017 Gurkha gets reworked interior and exterior to compete with its only rival, the Mahindra Thar. It is the only SUV in this price range to come with locking differentials at both the axles. Also, it is the only SUV to offer three-door, five-door and soft-top versions. Like the Thar, it also comes with power steering and manual air conditioning. Besides offering their utilitarian pickups mostly for commercial use, Isuzu also offers the D-Max V-Cross lifestyle pickup truck. It is a relatively premium offering of Isuzu’s D-Max pickup and it became an overnight sensation since its launch last year. There are plenty of customisation options available for the V-Cross as well! People jack it up with suspension lift kits and big wheels to make it look more menacing than it actually is! Though we have the Mahindra Scorpio Getaway and Tata Xenon XT, they are not as premium as the Isuzu D-Max V-Cross. With safety features like dual front airbags and ABS + EBD + Brake Assist and child seat anchors, the V-Cross is the most feature-loaded lifestyle pickup truck in India. The Duster was and still is the only compact SUV to offer an AWD (all-wheel-drive) drivetrain in the country. It was introduced in 2014, two years after the regular model was launched. Though it has a front-wheel-biased system, the Renault Duster AWD is a competent off roader and is renowned globally for its capabilities. It is also the most fuel efficient AWD/4x4 vehicle on this list with an ARAI-certified fuel efficiency of 19.72kmpl! The 2016 mid-cycle refresh/facelift has brought the much-needed styling and equipment upgrade in the Duster, while the current Adventure edition with its flashy aesthetic additions and denim upholstery makes it a one of its kind! Sharing the engine with the Tata Hexa, the Tata Safari Storme is the torquiest 4x4 offering in the sub-20 lakh space. The uprated 2.2-litre VARICOR diesel puts out a colossal 400Nm of peak torque. Compared to the Scorpio 4WD, it gets a limited slip differential, which is a boon when it comes to off-roading. The quintessential Safari styling (first-gen model) has been carried forward with the Storme, which people have an emotional connect with. With 200mm of ground clearance, you also ride higher than the Scorpio. And it gets things like heated outside rearview mirrors, which ensures all-weather visibility! Though 4WD is also available with a lower-spec S4 trim, we have picked the fully loaded S10 4WD of the Scorpio. With the second-gen model, the Mahindra Scorpio has absolutely raised the bar in the segment when it comes to features on offer. You get static bending headlamps, a large touchscreen infotainment system, LED tail lamps, and 17-inch wheels among others, while it carries forward the long equipment list of the first-gen model. The Scorpio makes a good case for itself as at this price point, it is the most feature-loaded 4x4 SUV out there! With an overall length of 4788mm (longest here), the Hexa perhaps has the most menacing stance on the road. Complementing its gigantic proportion is its segment-first 19-inch diamond-cut wheels and its Arizona Blue shade! The Hexa is also the only vehicle here to feature captain seats for its middle row, finished in Benecke-Kaliko all-black leather! Pamper your ears with its 10-speaker JBL sound system, which is certifiably the best audio system in the sub-20 lakh bracket. The Tata Hexa is the most economical vehicle here to offer drive modes with its 4x4 system (Auto, Comfort, Rough Road and Dynamic) and also six airbags, ESP (electronic stability program), TC (traction control) and others. Topping all is its extremely torquey 400Nm diesel engine, same as the Safari! An AWD model in the Mahindra XUV5OO’s line-up starts at around Rs 16 lakh. But we have picked this range-topping W10 AWD AT as it is the only SUV in the sub-20 lakh bracket to offer an automatic option with an AWD drivetrain! If you think the Scorpio is loaded to the brim, the XUV5OO take the equipment list to a whole new level in the sub-20 lakh bracket. You get a sunroof, electrically adjustable seats, passive keyless entry with engine push button start-stop, Android Auto, and brake energy regeneration system, to name a few! Undoubtedly, both the Mahindras are the most feature-loaded 4x4 SUVs out there in the sub-20 lakh bracket! The Jeep Compass gets brownie points for being the only offering from a premium brand in the sub-20 lakh bracket equipped with a 4x4 drivetrain! Jeep absolutely surprised everyone with the Compass’ pricing, which starts at Rs 14.95 lakh (ex-showroom, New Delhi). You get a fully loaded 4x4 variant at a price where people were expecting the base variant to begin! That’s a big achievement! Its snob value is practically unmatched in this space here. It is certainly one of the most capable off-roaders out there with Jeep’s famed Active Drive 4x4 drivetrain coupled to its Selec-Terrain drive modes: Auto, Snow, Sand and Mud! It looks like you’re buying a baby Grand Cherokee, Jeep’s flagship SUV. Powering the Compass 4x4 is the most powerful 173PS 2.0-litre diesel in the sub-20 lakh price bracket.